I just wrapped up my Sorbet quilt, which was inspired by Leanne's Reflection at She Can Quilt. It is composed entirely of 2 1/2" strips sewn into strip sets, cross-cut, reorganized, and then sewn together into this pretty. The value shift between the rainbow-bright blenders and the low-volume prints gives a dramatic overall affect. If you want to make your own, I have it covered. Download my step-by-step color instructions here. I primarily used Alison Glass's Sun Prints line and Pearl Bracelets by Lizzy House, along with other modern blenders and low volume fabrics that coordinated with the color scheme. Fabric.com has many of Sorbet's fabrics available at their online store too, but you'll need to order in half yard increments. Professional long-armer, Linda Noordt did the long-arm quilting in a graceful floral pattern. I used a Benartex floral fabric for the backing and binding. The way it ties in all the colors within the top is really working for me. Such a beautiful finish. It looks so pretty in your pictures. Ooh it's proper summery, fab! Very cute finish! I love the sunprints line and from a distance I didn't even realize that you used them! It's amazing that given the arrangement, that first I saw the overall pattern, then I saw the individual fabrics. How big is it? 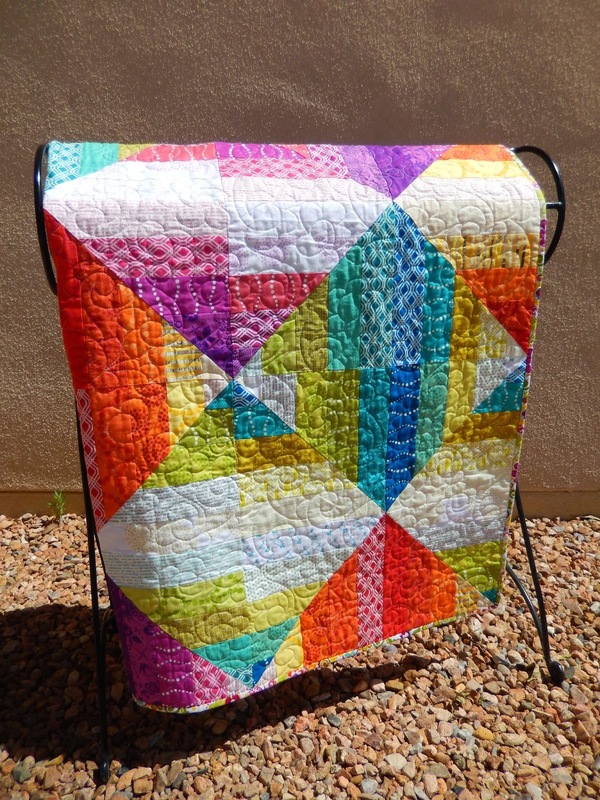 Such a fun and bright quilt to look at! Love it - it is so vibrant. this would live very happily in my house! Your quilt caught my attention because it seems to 'sparkle'! I want to make it! You said you used low volume fabrics, something I've never heard of. What do you mean by 'low volume'? Beautiful: How many jelly rolls would this quilt take? Thank you very much!